India eased their way to a 3-0 series win over New Zealand by clinching the 3rd ODI with a clinical 7-wicket win. India were chasing 244 after a fantastic bowling effort, with Mohammed Shami leading the way with a three-wicket burst. With the bat, Rohit Sharma and skipper Virat Kohli came up with efficient half-centuries to ensure there were no wobbles for India. With the series in the bag, India can now experiment in the remaining two games. Shami was adjudged man-of-the-match for his bowling effort. Kohli was there as translator as in the first game he answered questions in Hindi. But, this time a confident Shami went for it in English. 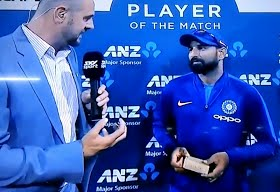 Impressed with his England, former New Zealand pacer Simon Doull, who was in charge of the presentation said, "Your English bahut acha, congratulations," Doull told Shami as Kohli could not control his laughter.